Opel has packed the Insignia Grand Sport sedan, right, and Sports Tourer wagon with new technology. Opel hopes a wide selection of advanced safety and equipment technology in its new Insignia will lure buyers from premium brands. The brand's flagship model now offers features such as head-up display, advanced driver assistance systems, an eight-speed automatic transmission and torque-vectoring for better handling. "While you will undoubtedly find some of these features in models offered by our competitors, you will not find them all, and that's what sets the Insignia apart from the rest," the car’s chief engineer, Andreas Zipser, said. "Our new flagship naturally has to hold its own against its conventional rivals in the volume midsize segment, but we also want to poach customers from the premium brands," Zipser said. That means the Insignia must win back not only VW Passat, Skoda Superb or Ford Mondeo buyers, but also those deserting to premium rivals such as BMW, Audi and Mercedes-Benz in Europe's stagnant but high-margin midsize segment. 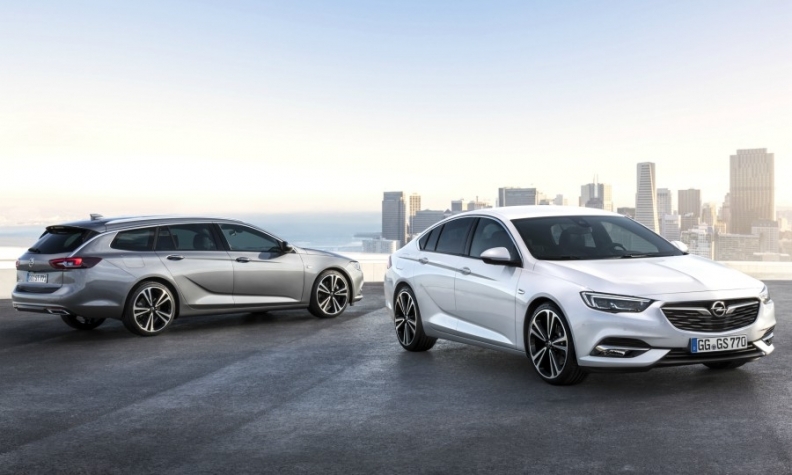 Opel hopes company car drivers given a limited budget by their employers will pick a fully equipped Insignia that is roughly a third less expensive than an equivalent car with a luxury badge. With the second-generation Insignia, Opel has addressed the weaknesses of the previous-generation model, reducing weight and overhauling a confusing user interface – all in a roomier, more stylish package with a new design heavily inspired by its 2015 Monza concept. Despite a wheelbase lengthened by 92mm for additional interior space, the Insignia sedan's Epsilon 2 platform from General Motors means that the sedan variant is up to 175kg lighter than its predecessor. "By using ultra-high-strength steels, we shaved 59kg off the body-in-white. Thanks to improvements like that, we were then able to take out weight elsewhere, since axles and brake discs can therefore be lighter as well," Zipser said. The weight reduction means better fuel economy as the 1.6-liter diesel variant, for example, uses up to 10 percent less fuel. The Insignia comes optionally equipped with safety features such as lane-keeping assist, adaptive cruise control, blind-spot detection, parking assistance, rear-cross-traffic alert for reversing and a 360-degree camera view when maneuvering in tight spaces. It is also the first Opel to have active pedestrian protection as standard, which means the hood pops up in a front collision to help reduce injuries. Technology: The Insignia uses GKN's all-wheel drive with torque vectoring. Power can be variably delivered to individual wheels for greater traction. When cornering, additional torque is transmitted to the outside rear wheel to reduce understeering. Connectivity: The user Interface is more intuitive with fewer buttons and more functions shifted to the middle console's touchscreen display; Wi-Fi hotspot with 4G; OnStar's concierge service can book hotel rooms and search for parking spaces. What's good: Stylish exterior with an extremely spacious passenger cabin offering plenty of rear legroom, premium level comfort and safety features including programmable damper settings, a massage function for the driver and heated rear seats. What's bad: Opel still lacks a sporty, fuel-efficient dual-clutch transmission. Volkswagen is still superior when it comes to perceived interior quality.